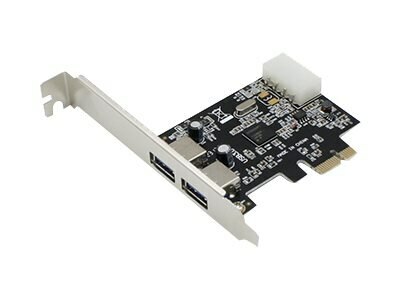 This is a PCIe x1 network interface card with dual open USB 3.0 ports that comply with IEEE 802.3 standards. Based on NEC D720200F1, this PCIe card expands your PC by adding two high-speed USB 3.0 devices from your standard desktop PC. that comply with IEEE 802.3 standards. It is based on a NEC D720200F1 chipset and is compatible with variety of different applications and operating systems, including Windows, Linux and Unix-like systems. Providing of network speed, it fully supports high-end servers and a variety of networking applications. In addition, this card supports high level VLAN filtering. The dual USB 3.0 port accommodates multi-mode, providing a reach up to . All of our network interface cards are 100% compliant, and offer a cost effective solution for all of your network upgrade needs. With our certification test program, we guarantee your product will work right the first time.